It’s difficult to talk about ‘value’ on a guitar that some may consider is expensive. However, compared to many guitars that cost a LOT more than this guitar, then this Taylor Academy IS good value. Well, in terms of build quality and tone. You get a sense that all your money is going on the materials; the woods ! That’s where the tone begins and ends after all. No frills here, just wood. If you think you may need to amplify it at some point then go for the Academy 10E which has a pickup otherwise, yeah, this guitar is very very good value. Designed and built with beginner guitar players in mind, the Academy Series 10 combines the full-bodied tone and response of the classic dreadnought shape with Taylor’s standards of comfort and playability. Our trademark neck, devised as a more practical take on the traditional guitar neck, makes it easier to fret strings, hold chords, and bend notes, thanks to a slimmer profile and the slightly shorter 24-7/8-inch scale length of the Academy Series. Plus, the Academy 10 ships with one of our most premium features: an armrest, which provides a more comfortable fit for players who are just learning how to manage the larger body of an acoustic guitar. 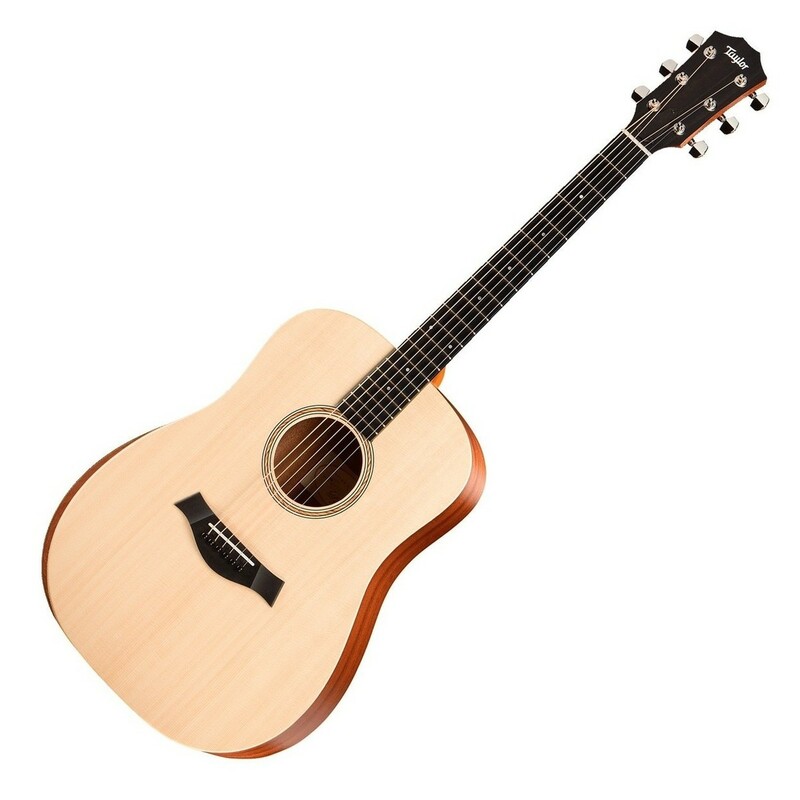 With a solid spruce top and layered sapele back and sides, the dreadnought shape of the Academy 10 produces a warm sound with a strong low end and clear, ringing high tones, smoothened out by the punchy midrange of layered sapele. Between its rich sound and a comfortable shape built to invite inspiration, the Academy 10 provides a perfect solution for beginner players or those looking to buy on a budget.